It would be good to come up with two or three names just in case one in taken. To Registering your name go to http://www.godaddy.com/ type in the name you want to register , the system will let you know if that name is available.Follow the process and within minutes, you have locked up the domain name you selected. I recommend you setup your email account, with the name you selected, for example if you selected bestbounceinusa.com then your email should be setup as customerservice@bestbounceusa.com Buy an unlimited email plan, it is not expensive. For about $ 30 a year, you will be able to email back and forth, and not put up with the advertising banner and logos. Getting your website live and running for less than $250Do you want to have an online reservations system that comes complete with your own easy to edit website, sales reporting, scheduling system, automated marketing system that will leave the competition in the dust…A website that specialize in software for the bounce house rental industries ?Do you want your customers to get:-Real-time online ordering and reservations with automated receipts -Automated Reminders of their upcoming events-Automatic Reminders to order again next yearDo you want your website to be:-An SEO optimized website that takes orders around the clock (even while you sleep). 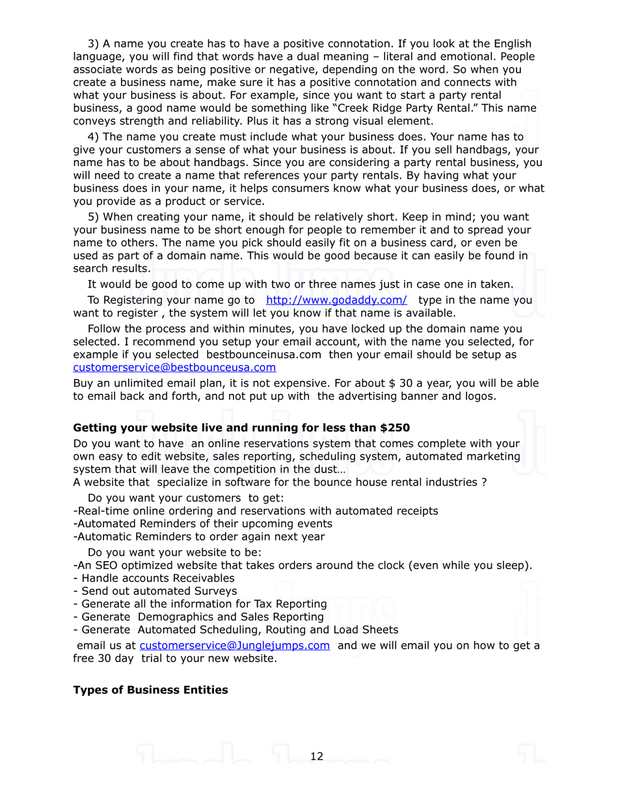 - Handle accounts Receivables- Send out automated Surveys- Generate all the information for Tax Reporting- Generate Demographics and Sales Reporting- Generate Automated Scheduling, Routing and Load Sheets email us at customerservice@Junglejumps.com and we will email you on how to get a free 30 day trial to your new website.Types of Business EntitiesWhen starting your party rental business you will want to consider the type of business to run. There are several different types. Below are the various business entities:1. Sole Proprietorship: This is the simplest one to start. You are not tied to any state registration or other formalities. A sole proprietorship usually consists of one person. This person controls every part of the business including actual control of it, all liability, and the right to sign contracts. 2. Partnerships with General Partners: This business entity contains two or more people who come together to work as co-owners. Their principle aim is to operate their business for profit. A general agreement is usually all that is needed to operate this type of business. 3. General Partnerships with Limited Partners: This business entity is formed by two or more persons, with the partnership having one or more general partners and one or more limited partners. A general partner is someone who is active in the business and liable for its obligations. A limited partner is an investor who is not involved in day-to-day management and not liable for more than his or her investment in the partnership.